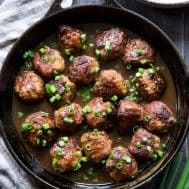 These easy one-skillet teriyaki meatballs are perfect for weeknights, packed with flavor and kid approved! The sauce is sweetened with dates, so they’re paleo and Whole30 compliant, with no added sugar. Perfect over cauliflower rice or with a side of roasted broccoli! 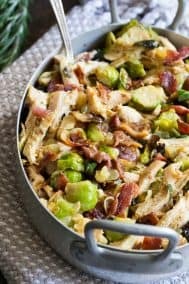 I’m all about the one-skillet recipes lately (or instant pot!) for weekdays lately. And if there’s a will, there’s usually a way. Now, if only I had a skillet the size of my entire stovetop, that would be seriously helpful. Then I could truly make a one-skillet meal for the whole family. But, let me tell you – a skillet that big just isn’t possible, so we go to the next best thing – today’s one-skillet teriyaki meatballs. They’re ready in 25 minutes and oh-so-tasty! As in, my-pickiest-eaters-loved them-tasty. You see, this meal was inspired by my picky eaters to begin with. 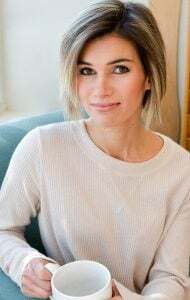 Specifically, my daughter Emily, who seems to be okay eating things that are drowning in either ketchup or teriyaki sauce – both sweet, I get it. After making a successful teriyaki pork tenderloin, I decided to go more kid-friendly with my teriyaki creation and make meatballs! 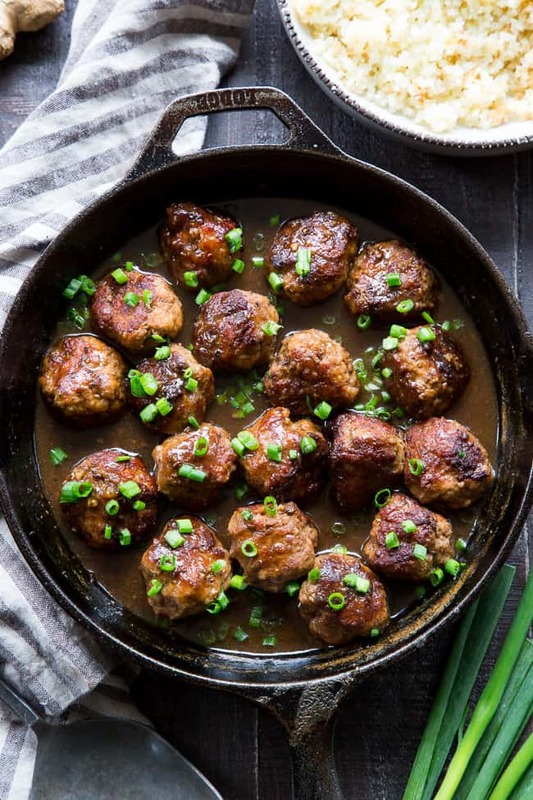 Always a favorite in my house, meatballs seem to do no wrong – something I highly value in a weeknight dinner. And, of course, they’re so easy to prep since everything goes in a bowl and you mix with your hands. I can be somewhat utensil-challenged, so using my hands to cook always makes me happy. If you’re familiar with some of my other Whole30 compliant “sweet” sauce recipes, you know that I puree dates to add to sauces that are traditionally sweetened with sugar or honey. Honestly, you CANNOT tell the difference between date-sweetened and sugar-sweetened sauces – it’s amazing. Whether it’s ketchup or “honey” mustard – dates are where the magic is at and this teriyaki sauce was no exception! Since I wanted to keep the recipe one-skillet, you won’t be thickening the sauce before adding to the meatballs. Even better – you don’t have to remove the meatballs from the skillet after browning! As you can see, I can be lazy when it comes to making dinner – but that’s only good news for you! The breakdown of the method is like this: Blend the sauce, prepare the meatballs, brown the meatballs, add sauce to skillet, and cook until thickened (about 8 mins). That’s it! You can serve your meatballs over cauliflower rice, and/or with a side of roasted broccoli (my favorite way to eat broccoli). You can also just serve over your favorite sautéed greens to keep things nice and simple – the greens will soak up the yummy sauce, making them super tasty! One note on the binder for the meatballs – I use either blanched almond flour or tapioca flour in my meatballs mixtures and honestly can’t really tell the difference either way. If you can’t eat nuts, or don’t have any almond flour on hand, either tapioca or arrowroot starch will work just as well! I hope you’re ready for an easy, delicious and fun dinner – let’s cook! 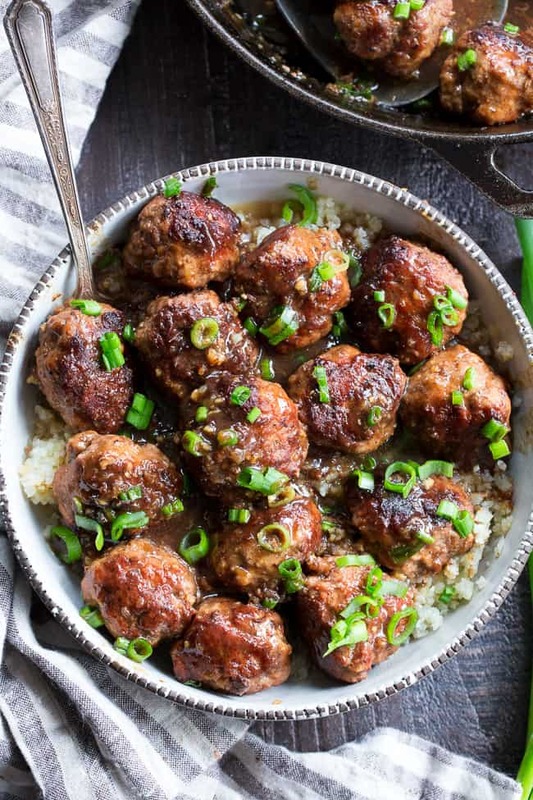 These easy one-skillet teriyaki meatballs are perfect for weeknights, packed with flavor and kid approved! The sauce is sweetened with dates, so they're paleo, Whole30 compliant, with no added sugar. Perfect over cauliflower rice or with a side of roasted broccoli! Soak dates in the hot water (it should be almost boiling) for 2 minutes. Pour the water and dates in a food processor or high speed blender along with the other sauce ingredients, leaving out the tapioca or arrowroot for now. Blend until smooth (or mostly smooth), then pulse in the tapioca starch to blend, set sauce aside. 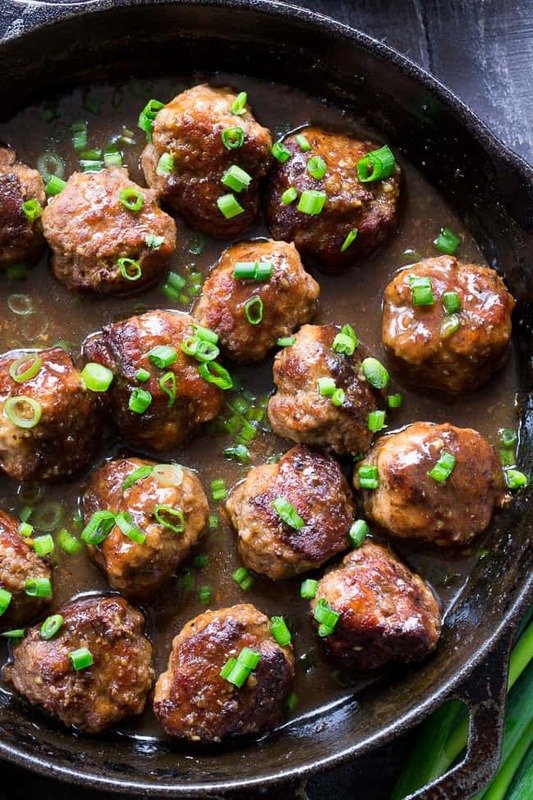 In a large bowl, combine all meatball ingredients except for green onions, and mix well with your hands. Heat a 12” heavy, deep skillet (nonstick is easier, or a well-seasoned cast iron) over medium high heat and add coconut oil. 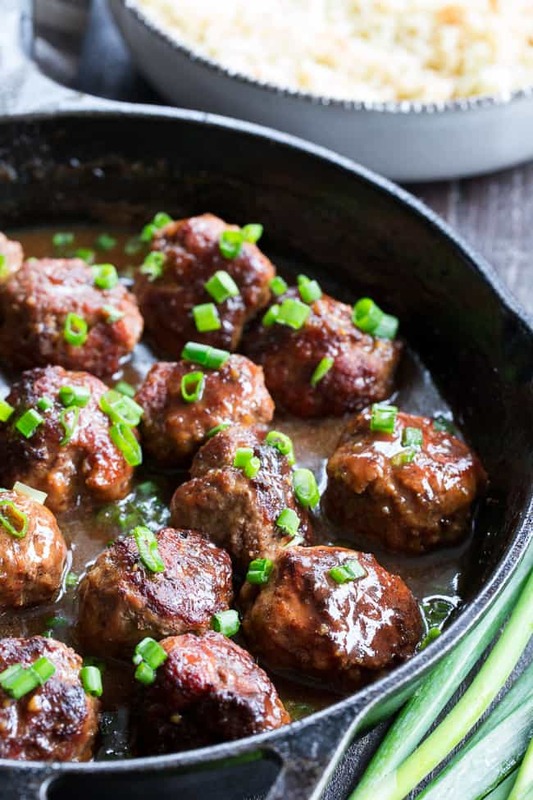 Using wet hands to prevent sticking, roll meatball mixture into 1 1/2” balls and place in hot skillet (you’ll make about 20) brown meatballs turning with a spoon just once or twice. You won’t cook them through just yet. Once outsides are browned, pour the sauce into skillet over the meatballs and lower heat to medium. Simmer meatballs in the sauce for 8 mins or until sauce is thickened and meatballs are cooked through. Turn meatballs a few times to evenly coat with sauce as they cook. Sauce will thicken more as it cools after cooking. 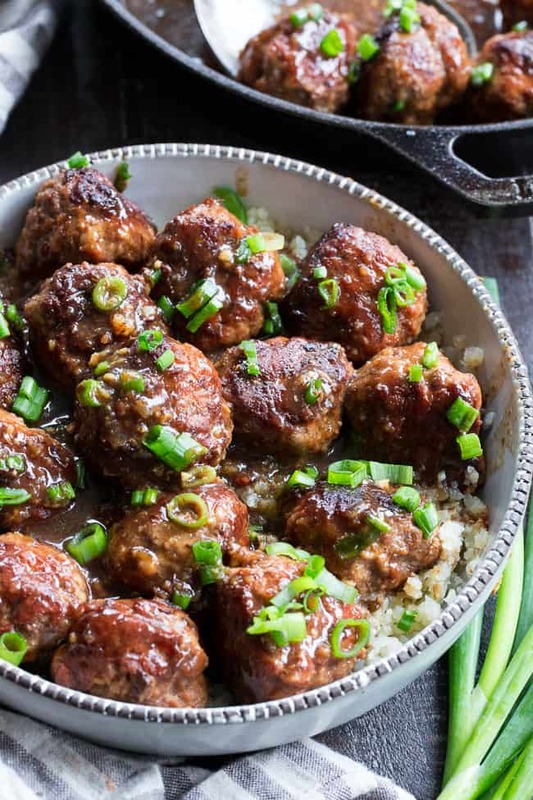 Sprinkle green onions all over meatballs and sauce and serve over cauliflower rice, roasted broccoli or any veggies you like. Enjoy! 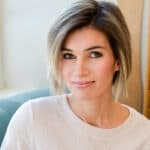 Want More Whole30 and Paleo dinner ideas? Try One of These! These look delicious! I read somewhere and have started using a small zucchini grated on the small side of a box grater for binding meatballs. It works, is extra nutrition and you can’t even see the green flecks (picky kids) in the meatballs after they’re cooked!! Love that these are whole30!!! Would you use the zucchini in place of the egg? We have egg allergy in our house, so that would be helpful. Also, we have a treenut allergy, so could I use coconut flour in place of almond flour? 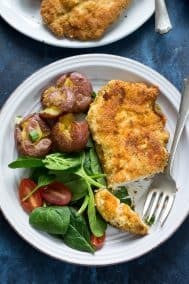 Can regular almond flour be used instead of blanched almond flour?? I’m new to using different types of flour and I recently bought almond flour. It might make the meatballs too grainy I’m afraid! hi, just wanted to say i love your site!!! i made these last night, doubled the recipe and baked them at 400 for 25 min and then added to sauce pan with sauce. omg soooo good! also made your chocolate cookies the other night and they were amazing too! please please please keep doing what you’re dong and sharing with all of us!! so appreciate you and this site! Oh that sounds great, thrilled that both recipes worked out so well for you! Oh that’s awesome! So thrilled you guys enjoyed! I made these tonight and they were a huge HIT! Served with roasted butternut squash and roasted broccoli. Oh that sounds perfect! Happy you enjoyed! Glad you enjoyed! Haven’t tried the braggs aminos but that could have been the issue. These were delicious! 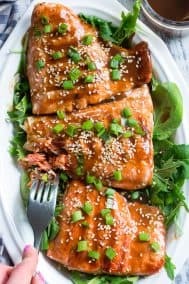 I’m not sure I’d categorize them as “teriyaki” so much as Asian BBQ (my family is pretty used to the store-bougth terijaki sauce flavor) but they were still a big hit, even with my picky eater. 🙂 Kicking myself for not making a double batch! Thanks, Michele for another great family dinner! I’ve never commented on a recipe before but after cooking this tonight I want to tell everyone how yummy it is!! I’m on Whole30 and wanted something different and delicious. This was it! I couldn’t find ground pork so I substituted ground chicken. It was wonderful! Thanks for sharing! That makes me so happy to hear! Glad you enjoyed! 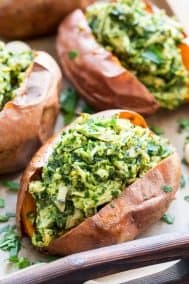 I made these with the sweet potato and apple hash and both turned out great! I used an egg substitute because some members of out family can’t eat eggs, it worked great. Thank you! 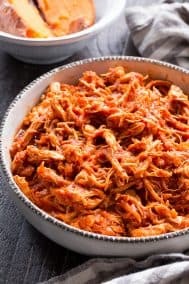 Could you make this recipe in the slow cooker? This looks delicious! I am planning on making it this week. 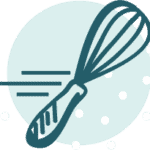 Could I use coconut flour instead of tapioca flour? Just when I think I can’t do another day of Paleo, a recipe from you saves me. This was so, so, so good!!!! Your recipes are so amazing. Thank you! i love your recipes! i would love to try these meatballs! we have a date allergy in the family- what would you suggest as a substitute? 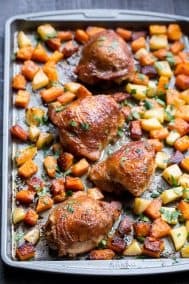 This is one of the best recipes I heard in my life. Thank you so much for share this unique recipe with us. Now I will share with my friends. One of my favorites! So delicious!!! I finally got around to making these. I wish I could give a 6 star rating. Very flavorful and easy. Can you make this with just beef? Made these for the family and everyone loved them! I added cilantro to the sauce and it was very tasty. Thank you for the recipe! 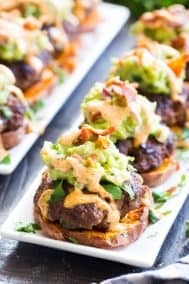 My husband cannot eat beef so wondering what you recommend as far as other ground meat (chicken or turkey) and how much of one with that pork? Excited to try!! I want to try this- do I have to add the ground pork? Could I just use more ground beef?